Arndt J.W., Oyama M.A. Agitated saline contrast echocardiography to diagnose a congenital heart defect in a dog // J Vet Cardiol. 2008 Dec;10(2):129-32. Examination of cardiac structure and function is greatly facilitated by echocardiography, which takes advantage of the natural ultrasonic contrast between myocardial tissue and the blood-filled chambers. In cases where further contrast is desired, peripheral injections of agitated saline, which contain highly reflective gas-filled microbubbles can reveal subtle morphologic lesions as well as characterizing the pattern and timing of blood flow through suspected cardiac shunts or lesions. 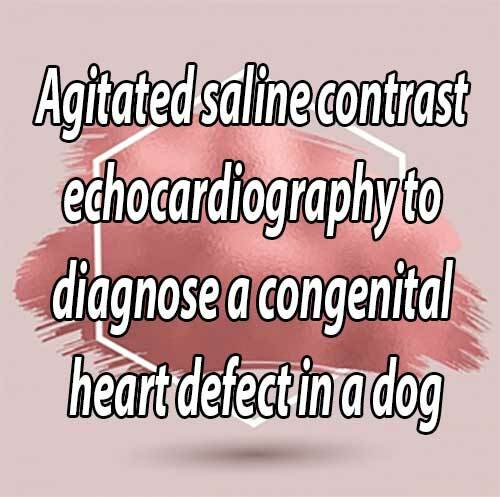 Agitated saline contrast echocardiography is easily performed and well-tolerated and in this report, we demonstrate the utility of this method to diagnose a rare congenital defect in a dog. A 12-year-old female spayed mixed breed dog presented to the Matthew J. Ryan Veterinary Hospital of the University of Pennsylvania for a chronic history of ptyalism associated with an ulcerated gingival lesion. On physical examination, a II/VI left apical systolic murmur was ausculted. No jugular pulses were noted. Thoracic radiographs revealed a normal cardiac silhouette and pulmonary vascular and parenchymal structures; however, a markedly distended caudal vena cava was identified. Abdominal ultrasonography revealed severe dilation of the caudal vena cava, hepatic veins, and splenic veins, with spontaneous echo contrast visualized in these vessels. No ascites was identified during the examination. A cardiac consultation and echocardiogram was requested for evaluation of a potential caudal vena caval or right atrial obstruction. Image interpretation: Fig. 1, Videos 1 and 2. Echocardiographic images and video cine-loops obtained from the left apical parasternal window. The simultaneous ECG tracings reveal sinus rhythm with periods of sinus arrest and ventricular escape beats. Fig. 1A and Video 1) Two-dimensional image and cine-loop identify the left atrium (LA) and right atrium (RA) based on their continuity with the tricuspid and mitral valve leaflets and the atrioventricular valve annuli. An additional atrial chamber (A) is delimited by the interatrial septum (arrowhead) and a membrane of tissue (arrow) with an apparent opening into the RA. Fig. 1B and Video 2) Color flow Doppler image and cine-loop reveal continuous and mildly turbulent flow from the accessory chamber through the perforate membrane and into the RA. The continuous flow pattern indicated the presence of a pressure gradient between the accessory atrial chamber and RA. LV, left ventricle; RV, right ventricle. Figure 1 Echocardiographic images from a dog suspected to have cor triatriatum dexter. A continuous ECG tracing revealing periods of sinus arrest and ventricular escape beats is shown along the bottom of the images. (A) Modified left apical view displaying the presence of an additional chamber (A) located near the left atrium (LA) and right atrium (RA). The accessory chamber is delimited by the interatrial septum (arrowhead) and a membrane of tissue (arrow) with an apparent opening into the RA. (B) Color flow Doppler study applied to a similar image as in (A) displaying turbulent diastolic flow between the accessory atrial chamber (A) and the right atrium (RA). LV, left ventricle; RV, right ventricle. Echocardiographic images and cine-loops obtained from the left apical parasternal window of a contrast bubble study. The simultaneous ECG tracings reveal sinus rhythm with periods of sinus arrest and ventricular escape beats (Fig. 2A and Video 3). 2-dimensional image and cine-loop obtained approximately 1 s after 4.5 ml of agitated 0.9% saline mixed with 0.5 ml of blood was injected into the right cephalic vein. Bubbles are seen entering (Video 3) and within (Fig. 2A) the right atrium (RA) and right ventricle (RV), while the accessory atrial chamber (A) remains free of contrast (Fig. 2B and Video 4). Image and cine-loop obtained approximately 10 s after 4.5 ml of agitated 0.9% saline mixed with 0.5 ml of blood was injected into the right lateral saphenous vein. Bubbles are visible entering into (Video 4) and within (Fig. 2B) the accessory atrial chamber (A) and flowing into the "true’’ RA and RV. These findings indicate the selective return of caudal vena caval flow into the accessory atrial chamber and crossing of the perforate membrane before entering the RA. Based on the agitated saline contrast study, a diagnosis of cor triatriatum dexter with selective return of the caudal vena cava into the accessory right atrial chamber was diagnosed. 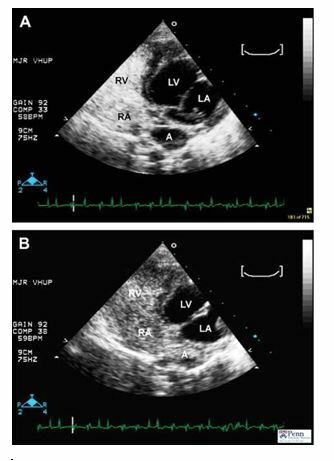 Figure 2 Echocardiographic images following injection of agitated saline in a dog suspected to have cor triatriatum dexter. A continuous ECG tracing revealing periods of sinus arrest and ventricular escape beats is shown along the bottom the images. (A) Modified left apical view obtained after injection of agitated saline into the right cephalic vein. Ultrasound contrast is noted in the right atrium (RA) and right ventricle (RV). (B) Modified left apical view obtained after injection of agitated saline into the right lateral saphenous vein. Ultrasound contrast is noted in the accessory atrial chamber (A), right atrium (RA) and right ventricle (RV). LA, left atrium; LV, left ventricle. Newer contrast agents, made of specially-engineered bubble materials and gases, are able to cross the pulmonary capillary bed and opacify both in the left ventricular chamber as well as the myocardium itself (via entry of the microbubbles into the coronary circulation). Agitated saline microbubbles, due to their size and instability, are unable to cross the pulmonary capillary bed in this manner, and are normally restricted to circulation within the right heart and pulmonary arteries. Thus, appearance of bubbles within the left heart or systemic circulation following peripheral venous injection is indicative of a right-to-left shunting defect. The anatomic location of the shunt (i.e., atrial, ventricular, or great vessel) can be identified by recognizing where and when the contrast appears within the left heart structures. For example, appearance of contrast in the aorta without simultaneous left ventricular or atrial opacification is most consistent with a right-to-left shunt at the level of the great vessels (i.e., right-to-left patent ductus arteriosus). 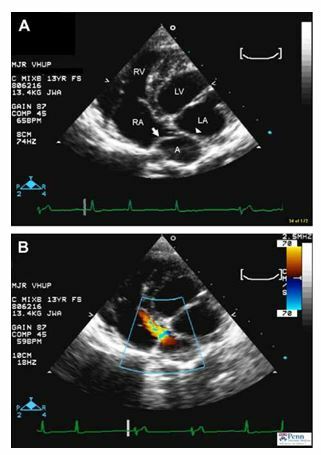 In this report, diagnosis of an anatomic cardiac abnormality was aided by contrast echocardiography. With selective injection into cranial and caudal peripheral veins, agitated saline microbubbles were able to document selective return of blood flow from the caudal vena cava into the accessory atrial chamber; communication between the accessory chamber and the right atrium through a perforate membrane; and achieve a diagnosis of cor triatriatum dexter, which had been suspected on 2-dimensional and color Doppler studies. The selective and unimpeded return of cranial vena caval blood flow into the "true’’ right atrium explains the finding of caudal venous congestion (i.e., enlarged hepatic veins and caudal vena cava) in the absence of jugular vein distension, which is unusual except in cases of selective caudal vena caval obstruction. Injection of agitated saline is best accomplished by placement of an indwelling peripheral venous catheter. Three to 5 ml of 0.9% heparinized saline is drawn up and mixed with 0.5—1.0 ml of blood. The addition of a small volume of blood likely decreases microbubble surface tension as well as promotes aggregation of bubbles, thereby increasing their stability and longevity in solution. The syringe can then be vigorously shaken by hand to agitate the solution and produce the desired microbubbles. Alternatively, the saline-blood solution is run back and forth through two syringes connected at right angles to each other by a threeway stopcock. Prodigious amounts of microbubbles can be created in this manner due to the turbulence of flow produced by rapid movement of fluid through the stopcock. The agitated saline is injected as a bolus and an echocardiographic cine- loop is recorded. Excessive amounts of injectate and microbubbles may cause shadowing and obscure far field structures while too few bubbles produce inadequate opacification. Large degrees of tricuspid regurgitation or poor right heart function may cause some microbubbles to persist within the right heart chambers for several minutes after injection; however this does not cause any adverse effects. Weyman AE. Miscellaneous echocardiographic techniques I: contrast echocardiography. In: Principles and practice of echocardiography. 2nd ed. Philadelphia: Lea & Febiger; 1994. p. 302—26. Gramiak R, Shah PM. Echocardiography of the aortic root. Invest Radiol 1968;3:356—66. Feigenbaum HMD, Armstrong WF, Ryan TJ. Contrast echocardiography. In: Feigenbaum’s echocardiography. 6th ed. Philadelphia: Lippincott Williams & Wilkins; 2005. p. 76—104. Hundley WG, Kizilbash AM, Afridi I, Franco F, Peshock RM, Grayburn PA. Effect of contrast enhancement on transthoracic echocardiographic assessment of left ventricular regional wall motion. Am J Cardiol 1999;84:1365—9. Hundley WG, Kizilbash AM, Afridi I, Franco F, Peshock RM, Grayburn PA. Administration of an intravenous per- fluorocarbon contrast agent improves echocardiographic determination of left ventricular volumes and ejection fraction: comparison with cine magnetic resonance imaging. J Am Coll Cardiol 1998;32:1426—32.